It's a side of Emma Watson we're maybe still not used to seeing. The former "Harry Potter" child star drops an F-bomb and steals alcohol from celebs camped inside James Franco'shouse in a new 30-second red-band TV trailer for the upcoming comedy, "This Is The End." The 23-year-old "Bling Ring"actress bursts into Franco's home wielding an axe and demands "everything you have to drink" in the new TV spot, which made its debut Tuesday. "I'm not f---ing around," Watson declares before bashing Seth Rogen in the face with her axe handle as a gesture to show she's not kidding. Afterwards, Danny McBride is seen lamenting over being robbed by "Hermoine." Some of the footage was already seen in a longer theatrical red-band trailer for the film released in April. Rihanna, Paul Rudd, Jay Baruchel, Jonah Hill and Channing Tatum are just some of the other stars playing themselves in this post-apocalyptic comedy, which marks the directorial debut of Rogen and his writing partner Evan Goldberg. The film is set at Franco's house, where one of his star-studded parties goes awry following some sort of widescale disaster. The stars in the film aren't sure at first what's caused all the looting and rioting around L.A., but as McBride ponders in the trailer, it could all be just because the Lakers won a game. 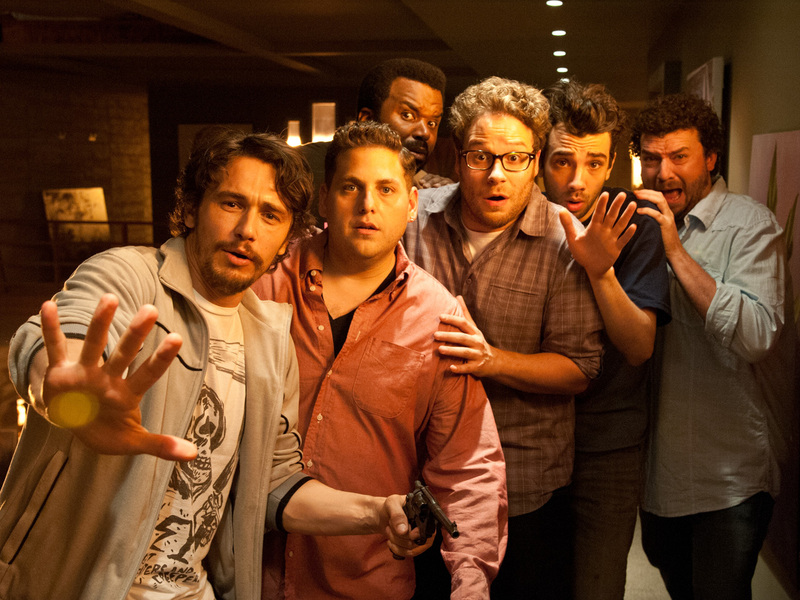 "This Is The End" hits theaters June 12.